Fat Bank By Dr Daniel Lanzer - Only Facility In Australia! Patients considering a liposuction, or a fat transfer, might encounter the term cosmetic fat bank. If you want to learn more about the cosmetic fat bank, and its use in cosmetic surgery, please read the information provided by the Dr Lanzer Clinic below. What Is the Cosmetic Fat Bank at the Dr Lanzer Clinic? Even though the cosmetic fat bank is not an uncommon term in the world of cosmetic surgery, many patients are not familiar with the function of it. However, the Dr Lanzer Clinic is the first Australian cosmetic facility to use a fat bank, so we are the people to talk to about this facility. The fat bank is meant for patients having liposuction, who are considering treatments which involve fat in the future. Instead of having the fat removed and disposed of after liposuction, our fat bank enables patients to store the fat in the fat bank after their liposuction procedure. Naturally, the fat obtained from liposuction can be used for cosmetic procedures in the future. How Does the Fat Bank at the Dr Lanzer Clinic Work? 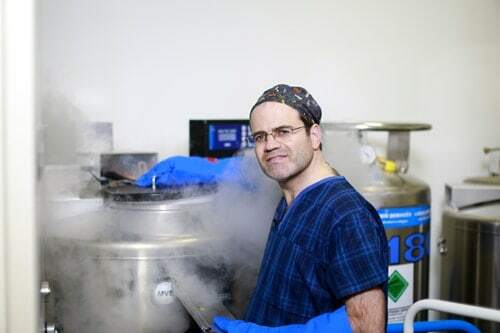 The Dr Lanzer Clinic fat bank is a high-tech facility, which uses sophisticated processes to prepare fat obtained from liposuction for future cosmetic procedures; this includes processes such as cleaning, preparing and slow-freezing the fat to a temperature of -190 degrees Celsius. If a patient is considering a procedure in the future, which could require the injection of fat in a treatment area, it is best for the patient to have access to their own fat. Unfortunately, the patient may not have enough fat available for successful fat grafting in the future, in which case the patient can use the fat that has been stored in the fat bank. The benefits of using fat from the fat bank is that it is the fat of the patient. Discover Cosmetic Fat Bank Advantages! An increasingly large amount of patients now opt for a Cosmetic Fat Bank. Therefore, having the ability to use your own fat for a future procedure comes with many advantages. Can You Explain the Journey of Fat When It Is Obtained by Liposuction? Once the surgeon extracts fat from a certain area of the body, the fat is treated with Adivive; this concentrates the fat. Then, the fat is prepared for freezing and stored in a sterile biological cabinet. During this process, the fat will also receive a bar code; this makes sure that the fat does not get misplaced or prevent that the patient ends up with the fat from another patient. After adding the barcode to the fat and the freezing preparations, the fat goes through a process called Cryopreservation. Then, the fat is frozen with a special slow-freeze device; this process takes exactly 90 minutes. Once the fat is frozen, the fat gets transported to a so-called ultra-cold freezer. The ultra-cold freezer is a long-term storage device and keeps the fat stored under a continuous temperature of -190 degrees Celsius; this compared to a regular freezer that hits -20 degrees Celsius. Fat that has been stored in the fat bank can be used for many procedures; this is usually a procedure to rejuvenate the appearance of the patient, or to increase the size of a certain body part. Therefore, stored fat often finds applications in procedures on the hands, buttocks and neck. It can also be used to treat areas with cellulite, scars and depressions. Could You Tell Me More About a Cosmetic Fat Transfer? Fat that gets stored in a fat bank is often used for a cosmetic fat transfer; this is the strategic injection of fat that results in a younger appearance. As a person gets older, the physiology of the face changes; this includes weaker muscles and a loss of elasticity in the skin. Naturally, these changes affect the contours of the body too. Therefore, fat transfer could be used to reintroduce fat in a certain treatment area and make it seem fuller and more youthful. During a cosmetic fat transfer, a cosmetic surgeon will inject fat into the treatment area; this fat is obtained from the fat bank, where the patient has stored fat from a previous procedure. However, if the patient does not have fat stored, the cosmetic surgeon can acquire the desired fat from another area on the patient’s body and prepare it for reintroduction. What Should I Know About the Recovery from a Cosmetic Fat Transfer? We recommend that patients leaving the clinic after a fat transfer contact someone to drive them home. We also advise against driving until you no longer experience any discomfort or side-effects from the procedure, since they could affect your ability to drive. Shortly after the procedure, it is common for patients to experience problems such as swelling and bruising. These side-effects will reduce over time, but the patient must take good care of the treatment area during the recovery to prevent complications. Most patients can manage discomfort after their fat transfer with over-the-counter pain medication. However, your cosmetic surgeon can prescribe some medication to manage any pain you may experience after your cosmetic fat transfer. If you want to take any medication after your procedure, be sure to check with the Dr Lanzer Clinic if this is okay to do so, unless the medication is prescribed by Dr Lanzer. Why Should I Choose the Dr Lanzer Clinic for a Cosmetic Fat Transfer? We were the first Australian clinic to introduce the fat bank in Australia, so our medical and laboratory team has extensive experience with the process. Patients can also count on the services of Dr Daniel Lanzer, a cosmetic surgeon experienced in liposuction and fat transfers. So, the Dr Lanzer Clinic is the advised choice for patients who only want the best! Do you have any additional questions about our cosmetic fat bank or the cosmetic fat transfer? Learn more about this process by requesting more information from the Dr Lanzer Clinic, or by contacting our friendly team of receptionists. What Is the Cost of Using the Fat Bank? The cost of storing your fat in the fat bank can be variable, since it also depends on the liposuction procedure that is used to obtain the fat that will be stored in the fat bank. Since there are many factors to consider, it is always recommended to ask for an estimate. At the Dr Lanzer Clinic, patients can get accurate estimates for various procedures; this includes liposuction and the use of the fat bank. Patients can request their estimate in person during their consultation, but estimates can also be obtained via email. If you are curious about the procedure or fat bank cost before you visit the Dr Lanzer Clinic, be sure to contact our friendly team of receptionists, or contact Dr Daniel Lanzer via email for an estimate.